Access & Alpha in Singapore: on March 22nd 2019, we hosted the first alternative data event in Singapore. We conducted a survey with the buyside firms and some of the insights are presented below. Key Challenge: quality screening of alternative datasets is the key challenge faced by buyside firms. Eagle Alpha has developed a proprietary tool to perform dataset quality testing. To learn more about our proprietary tool, contact enquiries@eaglealpha.com. Survey Results: what is your firms top challenge regarding alternative data? 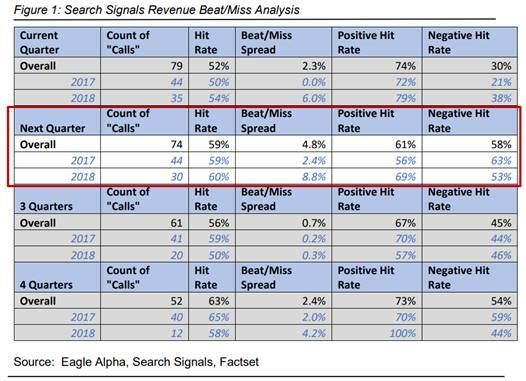 Search Signals: Recent analysis of Eagle Alpha’s Search Signals dataset shows a “hit” rate of 60% on reports published integrating the data. The hit rate is measured by tracking the direction of revenue estimate revisions in subsequent quarters. Contact enquiries@eaglealpha.com to learn more. NYC on May 15th. Wells Fargo is the latest sponsor of the event and we now have over 100 funds signed up. Register your interest at https://nyc2019.events.eaglealpha.com/. London in October. Register your interest at events@eaglealpha.com. NYC in December. Register your interest at events@eaglealpha.com. Consumer transactions data provider is meeting funds in London on April 2nd & 3rd. B2B data provider is meeting funds in London on April 16th & 17th. A data aggregator is meeting funds in NYC on April 16th & 17th. Quant: this vendor gathers data on over 10B web and mobile pages from e-commerce, auto, travel, entertainment, social and news platforms, then apply deep learning and visual recognition technologies to create a data profile of both listed and unlisted companies, in order to help investors predict companies’ revenues and stock price movement. Our Data Sourcing clients can view the full profile here. Discretionary: this vendor provides real-time data on physical products and places using Wi-Fi and Bluetooth signals. Our Data Sourcing clients can view the full profile here. New dataset: this vendor’s platform allows users to search and analyze tender data from 33 jurisdictions (28 EU member states, Norway, the EU Institutions, Iceland, Switzerland, Georgia). Our Data Sourcing clients can view the full profile here. Open Sourcing This Week: Chartify: Bokeh, but less headache – this python visualization library addresses one of the most annoying things about data science in python: Bokeh. Bokeh is an incredibly rich visualization library that is also incredibly hard to get completely right. Chartify, built on top of Bokeh by Spotify, aims to make that process much more approachable, while adding some new visual capabilities as well. What We’re Reading This Week: Rating London Properties by their “Pub Score”: An Alternative Lens on the London Housing Market – this complete project walkthrough touches on a number of relevant analyses and libraries for handling geospatial data in the journey to try and find the best house using a series of heuristic measures of quality, namely the quality of the pubs in the area. Alpha Focus Sessions: today we discussed how to work with various types of B2B datasets. Our next alpha focus session is on trade datasets and will be held on April 25th. Contact dataforum@eaglealpha.com to learn more. Dataset Costs/Pricing: a client asked us to launch a think tank comprised of buyside firms to discuss dataset costs. The output will be a white paper. To learn more email dataforum@eaglealpha.com. Standardized DDQ: we published the first draft of the DDQ document. Contact dataforum@eaglealpha.com to learn more. Alternative data is helping to close the information gap in emerging markets. The health of a country’s economy is hiding in plain tweets. Advanced analytics in asset management: Beyond the buzz.